The NetApp SANtricity SSMS Add-in links your databases with NetApp E-Series/EF-Series storage components. Database files can be mapped to their corresponding storage components. 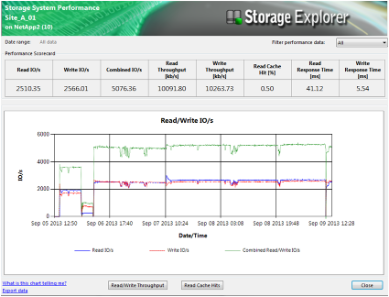 The Storage Explorer client shows the physical and logical relationships between storage devices, shows properties information about the storage devices and provides performance reporting. This enhanced visibility provides more efficient monitoring of the storage subsystem so that bottlenecks and capacity issues are more quickly identified and resolved. The plug-in is also multi-instance aware and cluster aware, allowing the DBA to use Storage Explorer in a management station. The plug-in itself is free and does not require a license.